Taking only minutes to set up, the Sedgwick TESH Tenoner is easy to use and accurate in operation. Work is positioned on the rolling table against an end stop and a fence, and is secured by a cam action clamp. Its end is then passed between two vertically mounted cutterheads which machine the top and bottom cheeks of the tenon. Its end is then passed between two vertically mounted cutterheads which machine the top and bottom cheeks of the tenon. The tenon width is set by raising or lowering the top motor, and its position on the timber by raising/lowering the two motors in tandem. Variations in shoulder length are set usinq the rule on the end stop, and staggered tenons are achieved by simple handwheel adjustment of the top motor, again reading from a rule. Each cutting head has provision for profile knives to enable the operator to match the cross section of the components being jointed. Alternatively the optional scribing head provides improved accuracy, ease of setting, and finish. Stepped tenons, splayed tenons, scribed tenons, double tenons, and multiple bridles are all possible on this versatile machine. Combinations of 90 degree and bevelled cutting discs with appropriate spacers can also be fitted to produce interleaved joints as used in sash window construction. The Sedgwick TESH is designed and built to withstand continuous production use. Its cast iron base, column and slideways provide a rigid and durable mainframe assembly, and the 2.2Kw supply motors ample power. 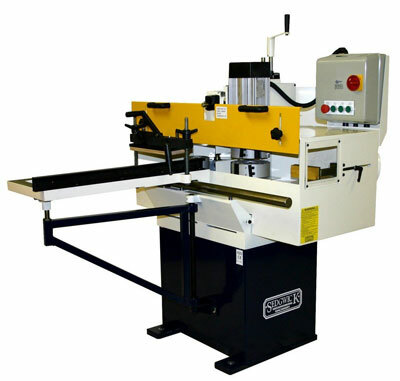 The generously roportioned cast iron sliding table is mounted on earing equiped hardened steel rollers for minimum wear, and cutterhead slide movements are easily adjusted on dovetail slides for ease of maintenance.